I wish I could write more enthusiastically about this. What, given the delay over Kurtág’s Endgame, still promised for next year, has turned out to be the first-staged of the Salzburg Festival’s four operatic commissions comes from the pen of a highly-regarded composer, and treats a subject that sounds, on paper at least, not only worthy but interesting. The story of Charlotte Salomon, a German Jewish artist, who created from her gouaches an autobiographical work, Leben? oder Theater? Ein Singespiel, completed in French exile, prior to her unspeakable end in Auschwitz (not featured here) would seem to propose many possibilities not only for plot and character portrayal and development, but also for contemplation upon the artist’s construction of her life, œuvre, and legacy. (I am not sure why Singespiel rather than Singspiel, although Dalbavie claims in an interview with Konrad Kuhn that the distinction allowed him to avoid the classical Singspiel fate of ‘music … interrupted by spoken scenes of “straight” theatre,’ in favour of ‘recited texts … woven into the music’. )Alas, Marc-André Dalbavie’s Charlotte Salomon proved, if not a failure, then simply rather forgettable, the concept offering more than the reality. What, then, was the problem? Part of it seems to have lain in a somewhat troubled genesis. An original libretto by Richard Millet, with whom Dalbavie had already collaborated on his earlier opera, Gesualdo, was rejected, Dalbavie finding that ‘Millet’s text doesn’t give one enough of an impression of the person Charlotte Salomon and of her work.’ Millet’s libretto has apparently since been published separately in book form. Barbara Honigmann was suggested by Luc Bondy – who had emboldened Dalbavie to reject Millet’s version – and prepared, reasonably enough, a German libretto, translated into French. However, Charlotte Salomon (as opposed to her fictitious alter ego, ‘Charlotte Kahn’) retains her spoken dialogue in German. Much was made in the programme about the ‘chemical reaction’ between French and German, and so on; in reality, such claims come across as special pleading for slight awkwardness. Moreover, Honigmann’s Epilogue underwent radical revision by Bondy and Marie-Louise Bischofsberger at what seems to have been quite a late – too late? – stage. This can only be speculation, given that I do not know what Honigmann provided, but the sketchy nature of the dénouement suggests that either more or less should have been done. 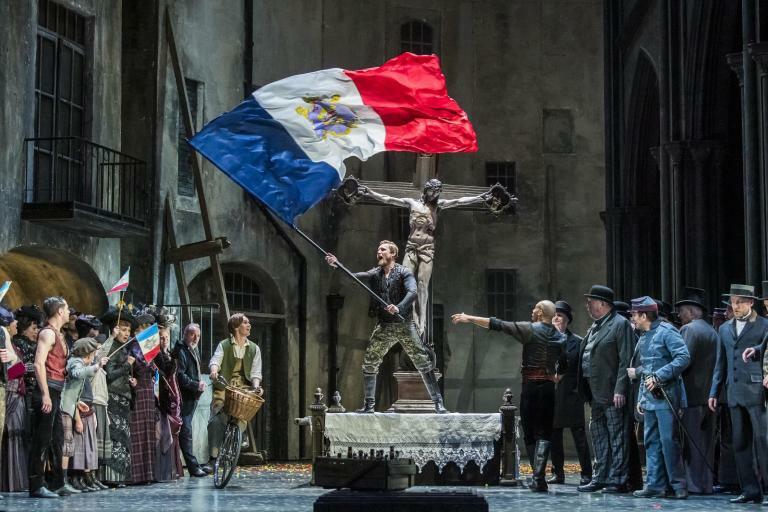 Moreover, whilst this is not an opera ‘about’ National Socialism, the almost-walk-on roles for a group of brownshirts, however admirably sung, veer dangerously close to a touch of brief,added ‘colour’. The opera also, I think, tries to do too much. There is nothing wrong with ambition, of course, but to write the Ring, you have to be Wagner, and so on. The Salomon project was of course in part to encapsulate her reimagined life in art, but to present what attempts to be almost an autobiography in operatic form proves too tall an order. The dramatic material actually comes across, metatheatrical intentions notwithstanding, as more suitable for a television mini-series, albeit necessarily condensed, than for a viable opera. ‘The movement of the music and drama,’ Dalbavie claims, ‘does not follow the model of a linear narrative,’ but that actually is very much how it came across to me. As long as Das Rheingold, and likewise presented without an interval – though I do not think a break would have done any violence here to the ‘two acts with a prelude and an epilogue’ – the experience is not tedious, nor indeed unpleasant, but nor does it, or rather in my case did it, inspire, move, or even really engage. Such thoughts and emotions as I experienced tended to be reflections upon either the idea of the work or the story that had inspired it. Bondy’s staging is perfectly decent, stylishly presenting the action, with a degree of simultaneity of action in the different rooms offered by the long stage of the Felsenreitschule. (Alvis Hermanis made more of a concerted effort in that respect for Die Soldaten, two years previously, but there we are dealing with a towering masterpiece which absolutely requires such treatment.) However, I wondered whether a more forthright metatheatrical treatment might have drawn out the latent aspiration of thework. Katie Mitchell, for instance, would seem to have been made for such themes.